Many of us have become accustomed to using a lift instead of the stairs, to save both our time and effort. However, taking the stairs might be just the thing you needed, to get back into shape. Fitness experts recommend stair exercises for a toned and fit body; these exercises are easy to include in your daily workout, helping you burn calories in a manner that is both pleasant and effective. On that note, let us move further and discover five of the easiest stair exercises that one can try out. After you have performed a basic workout, it is time to move on to the actual workout. Begin this exercise by placing both of your hands on the closest step to you (you can make the exercise easier by placing your hands on a higher step). Then, assume the position for the push-up and perform the actual push-ups. Try to do as many as you possibly can. The stair push-ups are excellent for toning the upper part of the body. If you are looking to work on your upper arms, this is the right exercise for you to try out. They are also recommended for toning the chest muscles. For this exercise, you will have to stay with your back to the staircase (at the level of the first step). Then, extend your legs, so that they are in front of the body and place your hands on the first step. Try to raise your body from the ground, flexing your elbows, until you reach the ground with your rear. Push your body in a backward direction, thus performing the triceps dips. When done, you can replenish your body with a healthy meal, contain plenty of anti-inflammatory foods. The stair lunges are recommended for the toning of the lower part of the body, being incredibly easy to perform. For this exercise, place yourself at a distance from the staircase (first step) and make sure that your hands are on your waist. After you have assumed the position, you will have to place your foot on the first step of the staircase (back should remain straight). Flex your knees, maintain the position for a couple of seconds and return. Switch sides and repeat. 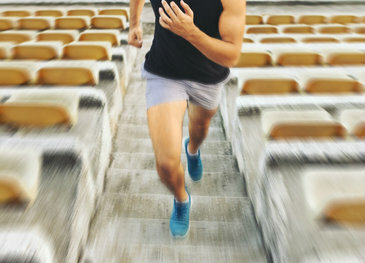 Stair exercises, like the two-footed jumps, are an integrated part of a lifestyle fitness. You can begin this exercise by standing at the staircase bottom, flexing your knees just for a little bit and moving your arms (swinging motion, back and forth). When moving your arms in the forward direction, jump on the next step. Repeat the procedure, until you cover as many jumps as you possibly can. If you want to increase the complexity of this exercise, you can try to jump several steps at once. Or, as an alternative, you can carry weights in your hands (you decide on the actual weight). This is a common stair exercise, one that is guaranteed to help you burn calories and stay fit at the same time. For this exercise, all you have to do is sprint up the staircase, deciding on your own how fast you will go. You can consume more calories by moving your arms back and forth. When you return to the original position, go back the stairs slowly (in this way, you will give the body the necessary time to rest and recover from the intense physical effort). You can repeat the stair sprints are often as you feel like it. These are some of the easiest stair exercises you can try out on a daily basis, to tone and strengthen your body. As you have seen, you can try exercises that are meant either for the upper or lower body. Many exercises address the entire body, working to develop cardiovascular fitness at the same time. There are many other stair exercises you can give a try, such as the one-leg stair squat, split squat or frog hopping. The more you train with the help of the stairs, the easier it will be to progress to the next level and try out a more complex workout routine.